To securely shred wipe erase scrub data is not as easy as you may think. When you delete a file using the default commands of the operating system (for example “rm” in Linux/BSD/MacOS/UNIX or “del” in DOS or emptying the recycle bin in WINDOWS) the operating system does NOT delete the file, the contents of the file remains on your hard disk. The only way to shred wipe erase scrub and make recovering of your sensitive data nearly impossible is to overwrite (“wipe” or “shred”) the data with several defined patterns. 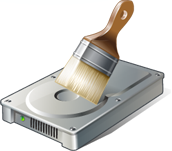 For erasing hard disk permanently, you can use the standard dd command. However, using shred command or wipe command or scrub command is a better option. Warning: Check that the correct drive or partition has been targeted. Wrong drive or partition target going to result into data loss . Under no circumstances we can be help responsible for total or partial data loss, so please be careful with disk names. YOU HAVE BEEN WARNED! First, download a Link knoppix Live Linux CD or SystemRescueCd live CD. Next, burn a live cd and boot your laptop or desktop from live CD. You can now wipe any disk including Windows, Linux, Mac OS X or Unix-like system. How do I use the shred command? -n 5: Overwrite 5 times instead of the default (25 times). -z : Add a final overwrite with zeros to hide shredding. Darik’s Boot and Nuke (“DBAN”) is a self-contained boot floppy (CD ISO also available) that securely wipes the hard disks of most computers. DBAN will automatically and completely delete the contents of any hard disk that it can detect, which makes it an appropriate utility for bulk or emergency data destruction. Download dban. Also don’t forget to read dban frequently asked questions. Please note that DBAN works well with MAC, PC (windows os) and Linux/BSD based system. Once you used the shred command or DBAN live cd on your disk, you can sell your laptop.